Ferrari released some info on their F430 Force Feedback Racing Wheel for the PC, which is a precise life-size replica of the real steering wheel on the Ferrari F430. The “Engine Start” button serves as a directional pad for the games, and the Manettino switch – which in the real car selects driving dynamics such as traction control, steering, and brake force – does the same in the video game car, as long as your playing Ferrari’s own Ferrari Virtual Race game for the PC. Ferrari Virtual Race is – as you can tell from the name – a racing simulator that was just released. Currently you can drive the 599 GTB Fiorano, 612 Scaglietti and 430 Scuderia, but they will be adding more cars soon, such as the California, F430 or F430 Spider and possibly (hopefully) more. If you’re more of a console gamer like me but still want to drive Ferraris, you can pick up the official (and inexpensive) Ferrari Challenge game for PS3, Nintendo Wii, Nintendo DS, or PS2, which lets you drive almost any Ferrari you can think of, classic and new. 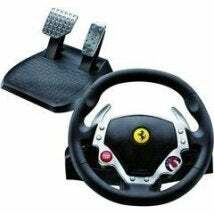 I’m a big fan of making racing games as realistic as possible, so I think this F430 racing wheel is great. It’s made from high-quality metal and rubber (not plastic,) and is a replica of the real F430’s wheel so you can be assured that the ergonomic and comfort aspect of the wheel will be spot-on. The included pedals are made from metal as well, and have magnetic resistance for a more realistic feel. The steering axle and ball bearings are also made of metal, ensuring the feel of fluidity and precision. Now, if they’d just make one with a clutch and shift knob. No Comments on "Ferrari F430 Force Feedback Racing Wheel"